Spending Christmas vacation on a cruise with her two cousins from hell isn't Holly's idea of a good time. And when in a moment of seasick-fueled desperation she lurches into an open suite--she's greeted with an eyeful of pepper spray. The culprit? A gorgeous guy calling himself Nick. But when Holly goes to make her exit, she gets the shock of her life: a corridor crammed with screaming teenage fans. Because Nick just happens to be Dominic Wyatt, drummer for ReadySet--one of the hottest bands in America. Suddenly rumors are swirling, and Holly's face is captured on countless phones and plastered all over the Internet. But the band can't risk a scandal destroying their family-friendly image, so Dominic convinces Holly to be his fake girlfriend--just for two weeks. How bad could it be to be fauxmantically involved with one of the cutest rockstars on the planet? Holly's about to find out. Marni Bates debut Awkward was such a great read for me, that I was super excited when I found out she was writing a new book that involved a rockstar and Christmas! 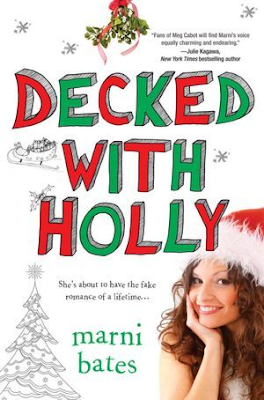 Decked With Holly plays on the whole accidental fame thing, just like in Awkward, but this time our characters are trapped on a cruise ship. Holly and Dominic's "meet cute" is more like a "meet hilarious disaster". It was definitely one of the most unique ways I've seen two potential love interests first introduced to each other. Once they give in to the inevitable and strike a deal that will save Dominic's reputation and hopefully help Holly gain some respect from her nasty cousins, things certainly get a little more interesting. Holly isn't exactly prepared for the paparazzi or what fake dating really entails. While I liked Holly and her snark quite a bit, she wasn't as big of a hit for me as Mackenzie was. There were plenty of laughs and some great characters, but there were parts that fell a little flat for me. I really liked Holly's best friend, but I wish we could have gotten more in person interactions between her and Holly. I guess maybe that's what didn't really work for me, the whole cruise thing. I liked the characters, even the mean girl cousins, and I thought the love story was really sweet, but having them all confined to the same place made the story drag for me a little. Overall this is a cute read and it will definitely get you chuckling. I love that it takes place during Christmastime, and of course rockstars are always fun to read about. While there were a few things that didn't work for me, I would still recommend this to anyone who is looking for a fun, quick contemporary read! This sounds really cute! I've been looking for something to read to get in the Christmas mood.